In celebration of the 40th Anniversary of the Center, throughout the next several issues we will be sharing its journey with you. Even though the Center was founded by Beverly and Richard Hutchinson, it has developed a life of its own. These articles will share the Center’s birth, growth, life and purpose as it continues to evolve and support students of A Course in Miracles. The vocation of the mind is to join, to heal the thought of separation, and that has been the vocation of Miracle Distribution Center (MDC). Over the last forty years, we have provided services, classes, workshops, retreats, and events that have brought a sense of unity to students of A Course in Miracles, but we have done so in a way that transcends the world’s approach of joining. The world of the ego sees joining as a form, i.e., bodies joining with other bodies. In a “spiritual” vein, some have thought this “joining” might look like a community in which you live, a group you must join, the need to only associate with people of the same mindset or belief, an organization you must be a part of, etc. But the purpose of the Course is to help us to see that the form of our lives is not our emphasis; healing and joining beyond form is our purpose. Pictured with Beverly are the president and staff of Natural Spirit, publishers of the Japanese translation of A Course in Miracles, when they visited the Center. The vocation of MDC may seem to contrast with the world’s view of an organization. On one hand, we provide listings that keep track of groups studying the Course worldwide, but we do not necessarily advocate people studying in groups. The Course is self-study; groups may be helpful, but are certainly not mandatory and should never become the substitute for an individual’s personal study. We believe in the transforming teachings of A Course in Miracles, and have built our lives and this Center around its principles but have no need to convert anyone to its curriculum. There is no membership. The Course is just one version of the universal curriculum, and we are here merely to be a help and support for those who find this to be their path. We also provide classes, retreats, and conferences with the purpose of providing a forum for students of the Course to join without a need to be the forum. Throughout the years, we have been blessed to have visitors from around the world make MDC one of their stops. We have an extensive bookstore of Course items and a meeting/studio facility in which we present ongoing Course classes and record them for free live streaming to the world. The walls of the room are filled with a pictorial history of Course events and presenters, as well as our national and international study group maps. Even though there is not much in the way of form at our Center, people seem to enjoy coming here — I think the spirit of the place has something to do with it! We are a center in the truest sense of A Course in Miracles, for we really redefine the word center. We are a “center” in content and purpose, but we are not the typical worldly definition of a center, since we are somewhat “formless.” We are located in Southern California and yet our work is international. We have close relationships with people across the globe whom we may never meet in person, and yet we feel as close to them as we do to the friend who lives down the block. As the Course reminds us, minds join, bodies do not. The vocation of the mind is to join, not just to visit bodies, but to join minds and hearts! Don’t get us wrong, we love having those “bodies” stop by to visit, attend a meeting, event, etc., but we realize it is not mandatory that they do so for us at MDC to feel connected to them or them to feel connected to us. God is not found in a place, event, or any one special person. God is found in every heart and mind that wants to remember they are one with their brother — not necessarily in form, but in purpose. 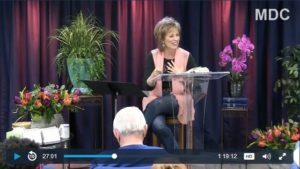 Since we began live streaming our weekly meetings free every Wednesday evening, we have been able to share the Course’s message around the world. Over the past year, viewers from 65 countries have joined us. Whenever a service of MDC is introduced, our primary criterion is whether a person — no matter where they are — can participate. That is why we have the national and international study group listings as well as our ongoing study group classes at the Center (which are recorded for listeners and live streamed for viewers across the globe), the Miracle Prayer Ministry, Prison Ministry, The Holy Encounter magazine, our Miracle Moment webcasts, weekly email updates, Daily Lesson Email, our online store, and our website, to name a few of our services. Through these services, people can feel a part of our work and a part of each other without ever having to leave home. For some, this is their only contact with other Course students. MDC can help most anyone, anywhere, feel a sense of connection and support. What is the vocation of the Center? Well, besides all the wonderful projects and services, MDC’s vocation is joining — a joining beyond the form, a joining with each of you and thereby with God.